When it comes to growing lights, Advanced Platinum LEDs are among the best. 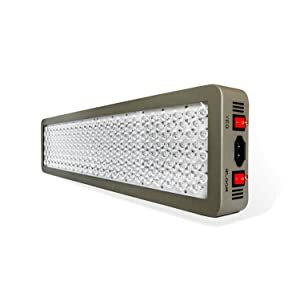 The Advanced Platinum LED lights have a great reputation and are reasonably priced when it comes to their quality. These lights are great and live up to their name. But, how do you choose which option from the series? An in-depth look at each of the options within the Advanced Platinum series shows that it’s not as simple as saying anyone is the best that works for everyone. The key is to look out for the information that’s misleading. As a rule, with grow, lights, don’t trust the information from the manufacturer. Because there’s no one regulating the industry very well, manufacturers can make any number of claims and not live up to them. The Platinum LED series offers a variety of LEDs that combine to deliver a full spectrum of light. This fact goes for all options within the Advanced Platinum LED series. Using a light spectrum and comparing the Advanced Platinum LED lights with others, the Advanced Platinum LEDs delivers all the colors that plants benefit from most. The goal with a grow light spectrum is to deliver the wavelengths appropriate for chlorophyll absorption. LED lights usually over a variety of colors of light. However, you specifically need UV, infrared, blue and white light for proper growth. If you compare the Advanced Platinum LED series to cheaper alternatives, there are more red and blue lights present in the Advanced Platinum LEDs. Red and blue lights help throughout the budding process for bigger yield and more potent product. TheAdvanced Platinum LED series has a great spectrum for lights. The ultra-violet diodes help plants throughout the vegetative stages and the infrared assists in sprouting. What this offers for growers is saving money because you have one light system that’s good for all growth stages. Because you configure the spectrum within the Advanced Platinum LEDseries, you can eliminate the need to rotate between different lights. This feature is available on the Advanced Platinum LED300, 450, 600, and XML 350. The only difference in the spectrum is that the variation of size is proportionate to the number of LEDs. Like many other manufacturers, Platinum LED doesn’t provide any PAR charts. But each light has a single PAR value associated based on the various distances between the light and plant. PAR and coverage area are so closely related because the PAR value is the intensity and power of the light from its centermost point, while the coverage is how far that light reasonably extends outward. Although PAR values don’t tell you much about the intensity outside the center, Platinum LED claims to have a consistently high PAR per watt. You can use this value with the coverage area and guess how much of that PAR extends outward. It is disappointing that Platinum LED doesn’t provide PAR maps, but that it’s not uncommon, so we’re not surprised. The 300, 450, 600, XML 350 all have different values and light coverage of their size differences and the variation in the number of LEDs. The Advanced Platinum LED 300 series offers a vegetative coverage of 4.5’ by 3.8’ and a bloom coverage of 3’ by 2’ with a PAR value of 1050. The XML 350 offers more intensity but not more coverage area. There isn’t an exceptionally large difference between the two, other than price. The Advanced Platinum LED 450 series provides a vegetative coverage of 4.5’ by 4’ and a bloom coverage of 3’ by 2.5’ with a PAR value of 1385. The Advanced Platinum LED 600 provides 6’ by 3.75’ vegetative coverage and 5’ by 2’ bloom coverage with a PAR of 1535. When it comes to PAR and coverage, Advanced Platinum LED is a top contender among even the best of brands. The best might seem like it’s theAdvanced Platinum LED 600 but when you’re looking at PAR value compared to coverage, your best bet is the Advanced Platinum LED 450. Advanced Platinum LEDs only use top of the line LEDs from Bridgelux and Cree. These are such high quality and focus on consistent performance from the diodes that they’re unaffected by surges and hardly ever require bulb changes. These LEDs are meant to run for 100,000 hours, and each diode is assisted with a 90-degree lens to concentrate the light towards your plants. Advanced Platinum LED is using a 3-watt chip which is most common in growing lights. Even the most powerful lights are using 3-watt chips. Occasionally exceptionally expensive lights use 5-watt chips, but there is only a slight difference. Overall the Advanced Platinum LED is a high-quality product, and they use top quality LEDs. The best deal gave size, and coverage is the Advanced Platinum LED450. It’s a decent value, but if you need something smaller, the 300 is a quality investment as well. Thanks a lot for sharing such a helpful idea and I have pleased to get this blog page. Are LED better than HID for plants? Could you please suggest me about this then I will be benefited.